Full iOS and Mac support – While some other video communications platforms only have limited support for Apple, Zoom runs on Mac and iOS devices including desktops, iPads, and iPhones. Regardless of if a user is on PC or Mac, Android or iOS, they get a very similar and highly intuitive user experience. Powerful collaboration features – iOS screen sharing, ability to schedule, start, and join meetings on mobile, and whiteboarding/annotations on iPad. Now let’s take a look at the newest Zoom features for Apple! 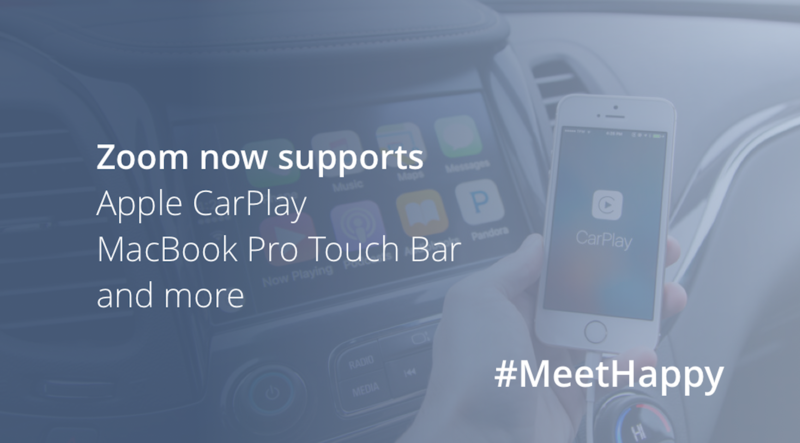 Apple CarPlay – Zoom now supports Apple CarPlay. This means you can now manage Zoom meeting commands, such as call a contact and accept meeting invitations, from the controls in compatible cars to take their meetings on the go. Although it may be tempting to fully immerse yourself in the Zoom experience while driving, remember to always keep your eyes on the road! Macbook Pro Touch Bar – We’ve integrated Zoom controls into Macbook Pro Touch Bars. Now Mac users can manage their meeting controls conveniently from the built in Touch Bar without having to use their mouse. Controls include start/leave meeting, schedule a meeting, share screen, start/stop recording, and mute/unmute. Theses controls are especially useful for managing a meeting without having to disrupt other features such as screen sharing. Stay tuned to our blog for all your Zoom updates! Want to bring these features and more to your enterprise? Sign up for a personalized 1-on-1 demo with a Zoom specialist today.